Created in 2006 in response to changes in federal regulations for Concentrated Animal Feeding Operations (CAFO), the Medium Farm Operation (MFO) program provides a Vermont-specific alternative to the federal permitting program that allows medium sized farms to seek coverage under a single General Permit issued by the Vermont Agency of Agriculture, Food & Markets (VAAFM). The program's requirements exceed those of the Federal Clean Water Act and aim to reduce the amount of phosphorus and other nutrients entering Vermont waterways. The Medium Farm Operation Program Rules establish VAAFM authority to develop regulatory requirements for Medium Farm Operations in Vermont through the MFO General Permit pertaining to the management of agricultural wastes and prohibits the direct discharge of waste into state waters. 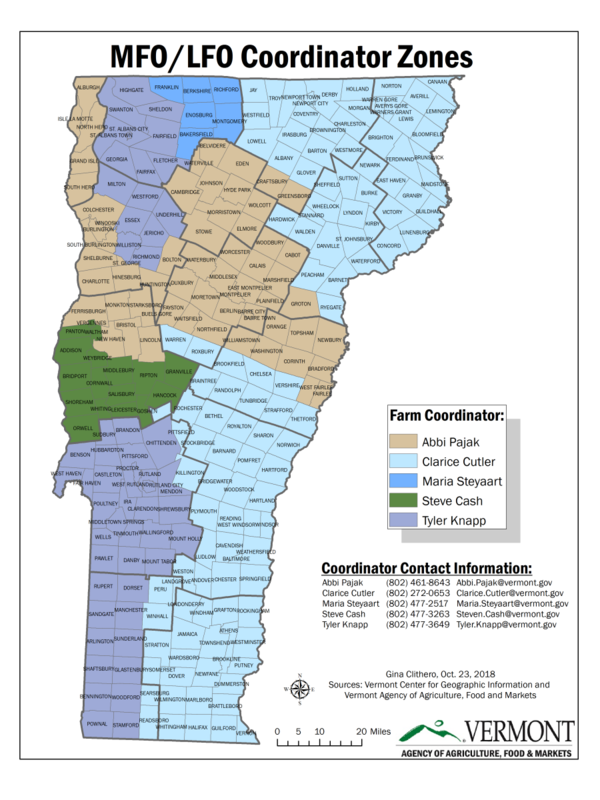 Unless otherwise given notice by the Agency, all medium farms in the state of Vermont are required to operate under the coverage of a General Permit. The Medium Farm Operation General Permit is valid for a five year period at which time it is renewed by the VAAFM. *Animals must be confined in a non-vegetated area AND the confinement must be for 45 days or more during a 12-month period. Existing MFOs shall have a field-by-field Nutrient Management Plan (NMP). Conservation practices shall be in place to assure that there are no discharges of wastes from the production area to waters of the state. The production area shall be managed in compliance with all applicable Required Agricultural Practices (RAPs). All land-applied wastes shall be applied at rates according to a Nutrient Management Plan (NMP) developed by a certified nutrient management planner or the permittee. All wastes generated shall be stored so as not to generate runoff from a 25-year, 24-hour rainfall event. The MFO shall be managed in accordance with the provisions of the nutrient management plan developed pursuant to Subchapter IV of the General Permit. The MFO shall implement erosion and sediment control practices for land clearing, field drainage, ditching, or other field maintenance activities to prevent adverse water quality impacts to surface water, groundwater, and to prevent movement of sediment across property boundaries. Adjoining surface waters shall be buffered from croplands by at least 25 feet of perennial vegetation measured from the top of the bank. New MFO operations must carefully review both the MFO Program Rules and the MFO General Permit before completing a Notice of Intent to Comply (NOIC) to be submit it to the Vermont Agency of Agriculture, Food & Markets. Annual Reporting and Operating Fee Requirements: Permitted MFOs must submit an annual report and operating fee of $1,500.00 to the VAAFM by April 30 of each year. Nutrient Management Planning: As part of the required Annual Reporting Requiremnts, MFOs must have an up-to-date Nutrient Management Plan and accurate nutrient (manure and fertilizer) application records. Terminating Ownership of MFO: A MFO may terminate General Permit coverage if it falls below the animal threshold for a MFO or is going out of business. The Notice of Termination must be submitted within 90 days of the termination of operations. Reporting an incident on a MFO: If for any reason there is a discharge of wastes from the production area to the waters of the state, the permittee shall notify the Agency orally within 24 hours from the time that the permittee became aware of the discharge. A written Incident Report shall be provided within 5 days of the discharge. Solid Waste and Non-Sewage Waste Importation Form: The Solid Waste and Non-Sewage Waste Importation Form needs to be submitted when the MFO wants to import any new substance or increase the amount of any existing substance imported that is within an IDP, or non-sewage solid waste. This Form needs to be submitted with the Manure, and Waste Generation, Importation and Storage Capacity Reporting Form. This Form needs to be submitted for each newly proposed imported waste other than other farm manure. There is not an associated timeline or deadline with this Form, as the timing when a MFO may accept these imports is farm operation specific. Manure and Waste Generation, Importation, and Storage Capacity Reporting Form: The Manure and Waste Generation, Importation, and Storage Capacity Reporting Form is required by all farms, to be submitted when the farm wants to import any new substance or increase any existing substance including those captured within an Indirect Discharge Permit (IDP), or non-sewage and solid waste. This Form needs to be submitted with the Solid Waste and Non-Sewage Waste Importation Form. There is not a timeframe associated with this Form as the farm isn’t able to accept the substance until ANR finalizes the IDP permit or solid waste permit.